Cape Canaveral, Fla. (AP) – NASA successfully inflated a new experimental room at the International Space Station on Saturday, May 28, producing the world’s first pump-it-up compartment for astronauts. The operation took much longer than expected, stretching over three days in all. But victory, when it came, was sweet. “A significant milestone has been accomplished,” Bigelow Aerospace, the inflatable chamber’s creator, cheered via Twitter. 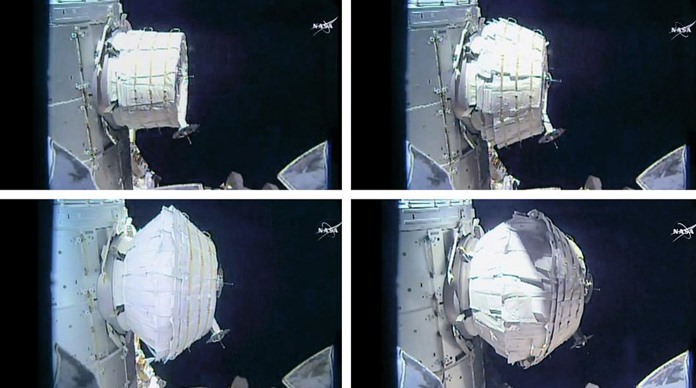 Astronaut Jeffrey Williams spent seven hours Saturday opening and closing an air valve to expand the compartment. Enough air finally seeped inside so that the puffy white pod could stretch to its full 13 feet in length and 10 ½ feet in diameter – the volume equivalent to a small bedroom. Internal air tanks provided the final pressurization to complete the job. Williams and his five crewmates will have to wait a week before venturing inside. NASA wants to make certain the chamber is airtight before opening the door. It was NASA’s second shot at inflating the Bigelow Expandable Activity Module, or BEAM, named for the aerospace company that built it as a precursor to moon and Mars habitats, and orbiting tourist hotels. 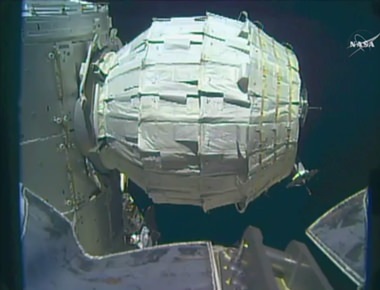 BEAM barely expanded during Thursday’s inflation attempt. Experts believe the soft-sided compartment was packed up tight for so long before last month’s launch that the fabric layers had trouble unfolding. Pressure inside the chamber was relieved Friday to ease the friction among the multiple layers. That apparently did the trick. The cubicle swelled an additional six feet in length Saturday, looking more and more like a giant beach ball with every pulse of air. In all, Williams opened the valve 25 times Saturday for a total of 2 ½ minutes’ worth of air flowing from the space station into the chamber. Popping noises could be heard as pressure built up inside BEAM – it sounded like popcorn in a frying pan. Officials said it was the sound of internal straps releasing as the pod swelled in both length and girth. The North Las Vegas-based Bigelow Aerospace provided this first inflatable room ever built for astronauts, which it based on a 1990s NASA concept. NASA paid $17.8 million for the technology demo, which could lead to an even bigger inflatable room at the space station. Founder Robert Bigelow, a longtime hotel entrepreneur, already is working on a pair of private inflatable space stations that could fly in a few years. He sees inflatables as the spaceflight’s future. Because expandable spacecraft can be compressed for launch, the rockets can carry more cargo, yet space travelers can still enjoy lots of room. The standard aluminum rooms that make up the space station – essentially fancy cans – can never be larger than what fits into a rocket. BEAM – empty except for sensors – will remain attached to the orbiting lab for two years as engineers measure temperature, radiation levels and resistance to space debris impacts. It will be off limits most of the time to astronauts, given its experimental status.